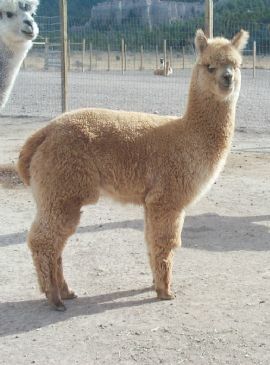 Titus is a 7/8 Peruvian male out of our Accoyo herd sire Amador PCA, who passes on his incredible fiber qualities to his crias. Titus has it all - extreme coverage and density from head to toe, fantastic crimp and lustre, and perfect conformation. We are very excited about our latest "wooly-bully" out of Amador. We think Titus has the makings of a great herd sire!